The individual photographs were taken on slide film, then scanned into the computer. They are opened in PhotoShop where the backgrounds are stripped away, where necessary. They are scaled, and all are assembled into one photo, which is saved as level 3 or 4 jpeg format. The assembly and compression allows for rapid internet loading. Instead of loading several, large photos, you are loading one smaller one. 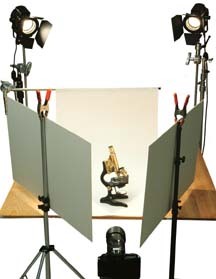 Photographing reflective objects, such as the brass microscopes, requires a special lighting setup. Direct lights on the objects produces a black image with washed out highlights (see photo1 at left) because the object is actually reflecting the room, which is not lit at all. The solution is to surround the object with large, white, evenly lit reflectors. In the setup photo shown below left, the lights are placed behind the object, and shine forward to light the reflector cards. A little of the light can be allowed to hit the object to help separate it with a rim light from the background. Special care must be taken to keep the light from falling into the camera lens and causing flare. Notice that the reflectors are actually positioned close to and behind the object. This is necessary with spherical objects because they reflect what is behind them. You can draw the reflectors very close together in front so that they actually touch the camera lens. The result will be like sample photo number 2 at left, where the brass areas are reflecting the white card reflectors. A variation on this lighting would be to move one of the lights to the front or side, but put it into a bank, or shine it through a large translucent material that is the equivalent reflecting surface as one of the cards. The advantage here is that the light is more directional and provides better definition, especially on non-reflective parts, on the object. With small objects, such as coins, watches, or silverware, you can build a "tent". Wrapping a translucent material, such as tracing vellum, into a cone makes the tent. Surround the object with the large opening of the cone, and wrap the lens with the small end of the cone. Position the lights to shine directly onto the cone from opposite sides. Because the object is completely surrounded with the evenly lit cone, this setup provides the smoothest lighting possible. Photographing through antique instruments requires special considerations. Older microscopes do not supply the steady platform of more modern instruments, and motion blur is the greatest enemy of microphotography. In addition, older condenser systems often do not light evenly. One way to alleviate camera shake is to lighten the load. If the camera must be mounted onto the microscope tube, use a light weight camera and a very simple camera-to-microscope adapter. I use a variety of cameras and adapters. Some of the systems -- like the Reichert and Leitz adapters shown at left -- work because they were intended for lighter microscopes originally. Most of these early adapters have the old Leica screw thread, which was common to many other cameras, and particularly the Nikon m-35S microscope camera. I sometimes use an older screw mount camera, like the Leica IIIf, which is still available and works well. Mounting a modern SLR presents other problems in addition to weight. Usually, the slapping action of the mirror is enough to blur the photo. For this reason, it is necessary to use a camera with a mirror lock up feature. Older Nikkormats work fine because they are light and have a front lock up feature that is perfectly positioned when the camera is mounted on the microscope. A more modern SLR, the Canon EOS A-2 has a feature that locks up the mirror two seconds before the shutter opens. This camera is light weight, and, like most SLR's, has the advantage of providing through the lens metering. To prevent the weight of the camera from slowly pushing the microscope optical tube down, you could use removable artists tape on the inner tube to prevent it from slipping into the outer tube. On microscopes having a focusing knob, use a rubber tipped clamp on the knob to act as a counter lever to the motion of the camera. A microscope adapter for the Nikon digital camera is sold by Zarf Enterprises, and can be custom made to fit any instrument. Photography through a digital camera has the advantage of image stabilization, which serves to eliminate the problem of motion blur at high magnifications. PHOTOGRAPHING THOUGH DELICATE OR ODD SIZED MICROSCOPES requires a different technique. In this instance, it is best to mount a single-lens-reflex camera on a copy stand, or tripod suspended over -- but not touching -- the microscope. A macro lens on the camera works best for this technique. With the lens close to, and centered over the eyepiece, you should be able to see through the microscope using the SLR camera viewfinder. Focus the microscope as you would normally, while watching the image in the camera viewfinder. It will also be necessary to focus the camera lens. Use the camera light meter to determine exposure, and photograph as you would normally, using a cable release to avoid motion blur. To obtain a full circular image of the microscope image, raise the camera up, away from the microscope. To obtain a full frame image, lower the camera to the microscope, until the two are almost touching. Do not allow the camera to touch the microscope, however, or you will risk blurring the image. The motion of the camera mirror and shutter can be transmitted through the microscope body, causing it to shake. 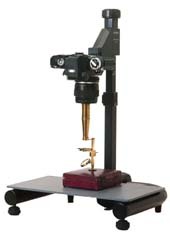 The Cary field microscope has a display of images taken through it using this technique. CREATING AN EVEN LIGHT is accomplished with translucent filters placed under the stage and above the mirror. Many older microscopes do not have filter holders so it is often necessary to tape a filter to the bottom of the stage. You could use any grainless translucent material. Artists tracing vellum works in a pinch. CORRECT EXPOSURE can be determined in a variety of ways. Most modern cameras have through-the-lens exposure metering, which greatly facilitates finding the correct shutter speed. Even so, you must compensate for photographing very light or very dark subjects by increasing or decreasing the indicated shutter time. The safest way is to bracket your exposures by taking one at the recommended speed, one over and one under exposed. If you are using slide film, the exposure is critical. Print film has a much wider latitude and can receive compensation when making the print. You will need to use a separate light meter, if your camera does not have its own meter. One such meter is shown at left. It is an older Gossen Luna-Pro with a microscope adapter. The adapter is made to allow the meter to be pointed directly down the eyepiece tube, but you can actually gain a correct exposure by reading through the separated eyepiece tube that extends from the side of many camera to microscope adapters. You will need to run a test exposure roll first. Take a light meter reading through the eyepiece. Then make a full range of camera shutter exposures, making note of each. After you process the film, determine the best exposure, and see which f/stop it corresponds to on your light meter. From then on, you can use that particular f/stop to determine the correct exposure.